Follow in the footsteps of Roman, Venetian and Byzantine sailors with this superb sailing cruise through the luminous blue waters of the Adriatic Sea, voyaging past dramatic landscapes to historic cities and scattered islands. Sail to the wooded fjord of Kotor, Montenegro's unspoilt medieval city and see the diverse highlights of Croatia including the ancient walled city of Dubrovnik and the picturesque town of Korcula with its rich history and unique beauty. A rare visit to Slovenia's tiny Venetian jewel of Piran completes your unique Adriatic odyssey. Dubrovnik, the 'Pearl of the Adriatic' is situated on the Dalmatian coast. Stroll around the red-roofed city with its well-preserved Gothic, Renaissance and Baroque churches, palaces and fountains, another UNESCO World Heritage Site. Kotor lies in Montenegro on the Adriatic coast and has been restored into a UNESCO World Heritage Site after it was damaged by an earthquake in 1979. Discover the well-preserved Old City of Kotor with building typical of the Middle Ages and medieval architecture, criss-crossed narrow streets and bustling squares. Framed by dense green forests of allepo pine and twisted cypress, the red tile roofs of Korcula, whose most famous native son was Marco Polo, form an inviting picture. The pale wheat coloured stone Cathedral of St. Mark houses a treasure trove of Dalmatian and Italian art. Walk through the towering Land Gate for a great view of the town. The warm sands of Cikat Bay are an irresistible magnet for beachgoers. In the fortified town of Veli Losinj, climb the 16th century tower and hear the history of the Uskoks, warrior refugees from the Turkish invasion who fled in 1526 to the coastal islands to start new lives under Hapsburg protection. Often described as an open-air museum, Piran is a very attractive city with a vast and imposing square - the Tartini - which opens onto the waterfront. The town walls have been well-preserved and have seven gates, surrounding many Itallanate buildings from the city's 500-year Venetian rule and medieval red-roofed houses. 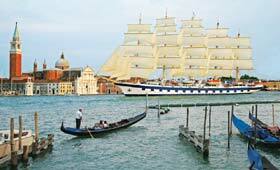 Disembark Star Flyer in Venice.